When you get Webhosting from Dreamhost, it comes with unlimited Email addresses. You can create as many Email addresses as you want for your website. If you wanted, you could also host your Email addresses elsewhere which will take some customization. Below I will show you how to create your own Email Address for your website. Assuming you already added your domain to Dreamhost already. Create email addresses for your websites in Manage Email. You can create as many email addresses as you want in Dreamhost because they give you unlimited email addresses. 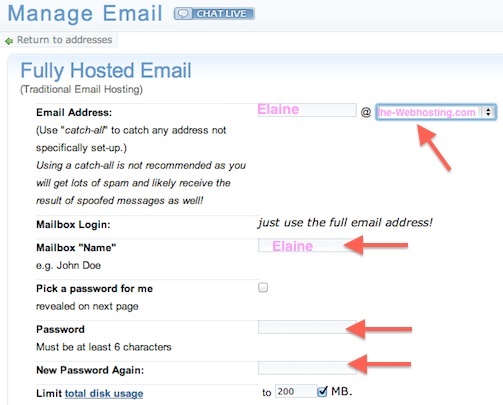 Create a new email address for your website in the Manage Emails in Dreamhost. Now you can enter your new email address details. First select the domain name you want to create an email address for and then enter the name/username of the email address and then the password. You can also set email file limits. Now you will see a green success message that you created your email address. Note: It will take a few minutes for this new address to become active.Please be aware that it may take up to two hours for the DNS changes to go live (because this is the first address set up on this domain). If it is still not working after that, please make sure that the domain name servers are pointed to us (and have been for at least 24 hours). If you need further assistance, please contact support.